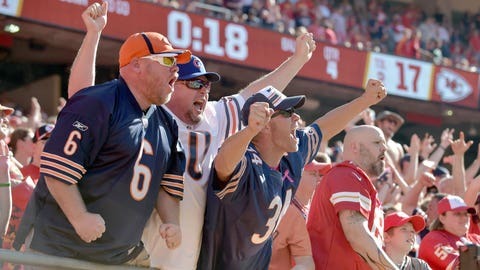 Bears fans made up a noisy minority at Arrowhead Stadium on Sunday. The Chicago Bears went into a hostile environment this weekend, as Kansas City’s Arrowhead Stadium is one of the NFL’s notoriously loud venues. The Bears managed the noise well and ended up beating the Chiefs, 18-17, in a thrilling Week 5 finish. The crowd was not much of a factor for the visiting Bears. In fact, at one point, a particularly loud contingent of fans successfully started a "Let’s go Bears" chant on the road, according to Kevin Fishbain of ChicagoFootball.com. “Let’s go Bears” chants at Arrowhead Stadium. Bears will start at their 34-yard line, 2:04 to go. This had to be demoralizing for the Chiefs fans in attendance, who also watched star running back Jamaal Charles go down with a serious knee injury during the game. Although Kansas City led 17-3 at halftime, the energy at Arrowhead was never enough to overwhelm the Bears. It’s big news for the Bears, who appeared to be dead in the water after the first three games of the season (all losses). Chicago has rebounded a bit from their poor start, and the fans haven’t entirely lost their enthusiasm for the team as a result.